Brusixm is one of the major dental diseases – up to 50% of the population have signs of significant wear on their teeth. While Bruxism can lead to Headache and Temporomandibular Joint Disorders (TMD) i.e. the joint between the lower jaw and skull, it also damages teeth and restorations. Bruxism is a major cause of tooth attrition. If untreated, even in a younger person with minimal tooth wear, the fact that there is a process occurring, can lead to severe damage to teeth over time. This process is exacerbated by several factors including the presence of acid in the diet, reduced salivary flow and certain medications. Fractures of tooth substance are also common, particularly involving teeth with deep and extensive restorations. Crowns, veneers, bridges, implants and inlays placed in the mouths of patients who have Bruxism are prone to porcelain fracture, or catastrophic failure due to overloading. However many porcelain restorations are inserted in patients where there is evidence of moderate to severe Bruxism – without any form of protection by many dentists. The overall forces of Bruxism are more severe during sleep and this is the time when most damage to restorations and teeth are likely to occur. 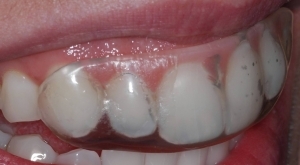 Despite having an important protective role, the occlusal splint is greatly underutilised. The clenching inhibitor covering the upper four or six front teeth actually reduces the intensity of clenching and grinding forces. This splint also represents effective, non-drug, no side-effect, treatment for many of the large population of people who suffer from headache.